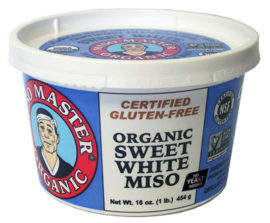 Miso Master Organic Mellow White Miso is one of our Short-Term miso varieties. These misos have their own unique position in the miso universe; in many ways this position is the mirror opposite of the Long-Term Aged Misos. Short-Term Aged or Mellow Misos have more rice koji (grain inoculated with aspergillus spores) than soybeans in their ingredient mix because they are designed to ferment quickly as the aspergillus mold moves quickly through the abundant starches in rice transforming them into simple sugars. Short-Term miso also have much less salt in their ingredient mix, thereby retarding the fermentation process much less than in the Long-Term Aged Misos. 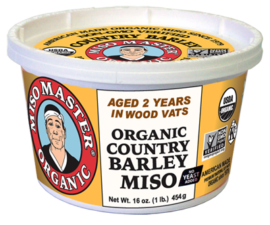 Miso Miso Master Organic Mellow White Miso is one of our quality crafted artisanal misos. For centuries Japanese craftsmen have used natural fermentation to transform soybeans and grains into many types of miso, the rich, thick paste used for flavoring a wide variety of dishes. Though now almost extinct in Japan, these ancient practices have been in constant use since 1980 at the American Miso Company, the largest traditional miso works in the world. This traditional method results in superior quality miso. Fresh and unpasteurized, it has subtle, balanced flavors that only great care, high quality ingredients, and natural aging can produce. MISO MASTER Organic Mellow White Miso is considered a Short-Term miso. These misos have their own unique position in the miso universe; in many ways this position is the mirror opposite of the Long-Term Aged Misos. Short-Term Aged or Mellow Misos have more rice koji (grain inoculated with aspergillus spores) than soybeans in their ingredient mix because they are designed to ferment quickly as the aspergillus mold moves quickly through the abundant starches in rice transforming them into simple sugars. These misos also have much less salt in their ingredient mix, thereby retarding the fermentation process much less than in the Long-Term Aged Misos. 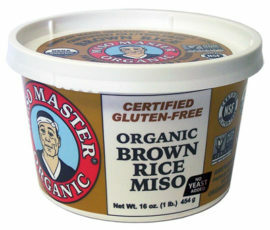 Because of its increased availability of starches, decreased protein and fat content, and lower salt proportion, MISO MASTER Organic Mellow White Miso has a much sweeter, milder taste than its Long-Term cousins. This distinctive, delicious salty-sweet taste is perfect for light summery miso soups and sauces. Mellow Misos deliver a unique flavor profile that enhances not just Japanese dishes, but many other cuisines as well. Mellow White was the first Short-Term Aged Organic Miso ever produced in North America and is Miso Master’s most popular and best-selling Mellow Miso! Short-Term Aged Misos also have their own distinctive health benefits. 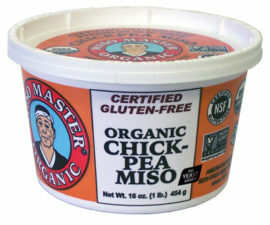 Perhaps because the aging time is so short, typically 90 days or less, the abundant food supply of starches in Short-Term aged Misos is not exhausted by the time the miso is packed and refrigerated. Because there is still abundant food for the lactobacillus bacteria at the end of the cycle, these bacteria are both much more numerous and more active than in Long-Term Misos. 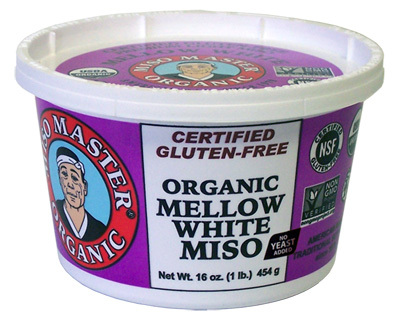 Miso Master Organic Mellow White Miso, therefore, gives a much more powerful dose of these vital probiotic bacteria essential for proper functioning of the digestive system, in many ways acting like non-dairy yogurt. These miso varieties also still have far more of the powerful anti-cancer agents isoflavone aglycones than unfermented soy products like soymilk, tofu, texturized soy protein, or most popular powdered soy supplements, even though they have far less than our Long-Term Aged Misos.